Perhaps just a few hundred years ago, or perhaps more than 10,000, Native Americans gathered at this spot above the Truckee River to the east of the expansive meadows that would one day become the city of Reno. The riverbed would have been broader and shallower, a healthier habitat for fish and wildlife, before the channelization done by the Army Corps of Engineers in the 1960s. There would have been no interstate highway just above the rock shelf, since the precursor to I-80, the California Trail, would not appear alongside the river until the Gold Rush of the 1840s. Neither would there have been a railroad along the other side of the river; the Central Pacific did not reach Reno until 1868. When the petroglyph panels comprising the Court of Antiquity were created this would have been a pristine location, where fish traps would funnel trout into reed baskets, and where hunters could hide within the rock crevices waiting for deer and antelope to come in range of their arrows, perhaps inscribing the panels of rock art while waiting for their prey. Click and drag to explore the Court of Antiquity. The red hotspots lead to additional views. In 2011 the Washoe County commissioners approved a plan to create a county park through a partnership with the Nevada Rock Art Foundation, the Washoe County Parks Department, and the Nevada Department of Transportation, in consultation with tribal authorities. The cost estimate was $2.8 million. 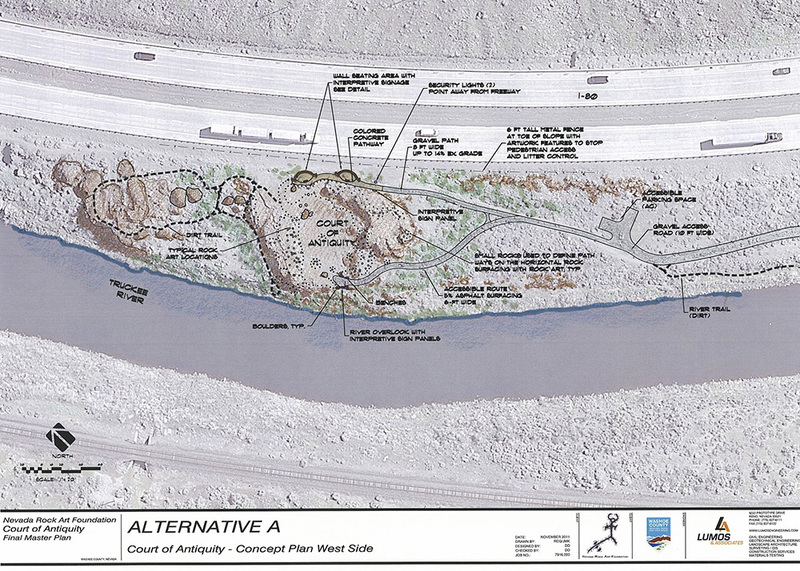 A site design (right) was created by the civil engineering firm Lumos & Associates in Reno. 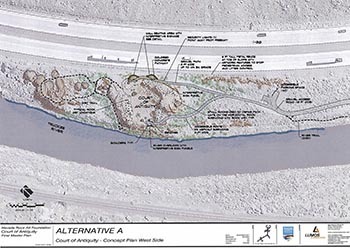 It is unclear in 2018 why the proposed county park has not been built, as it would have protected and made accessible a unique cultural and educational resource within just a few miles of the Reno population centers. With some civic determination, and the right funding sources, perhaps the project can be revived. Yes make this happen. Though it will expose the area to criminal damage, the majority of the residents need to learn about the idea that this area has been host to Americans for millenia.